Tate Britain (formerly "The Tate Gallery"), Millbank, London SW1. Designed by Sidney R. J. Smith. Built 1893-97; extension by Smith in 1899; several further extensions, 1926 onwards. 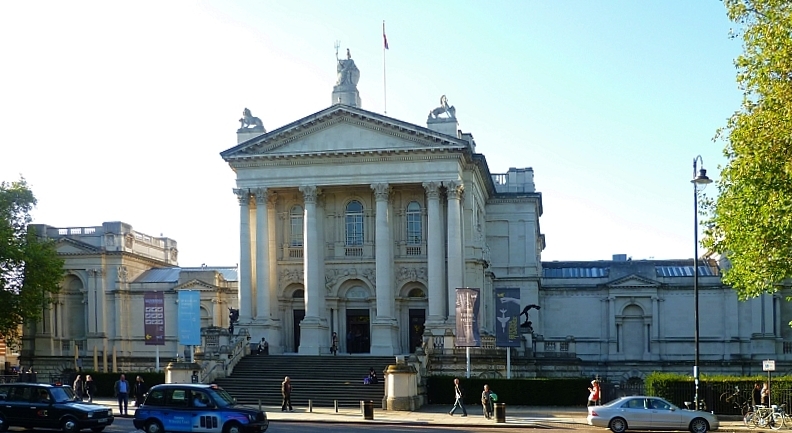 Once described by Arthur Mee as "the stately home" of modern British art (Mee100), Tate Britain's grand front entrance is through a portico of Corinthian columns, with pavilions at either side, at the top of sweeping steps. Above the pediment stands a proud Britannia with her trident, and at either corner stand the heraldic emlems, the lion and the unicorn. Smith himself described the building as being "in a free classic style, with a Greek feeling in the mouldings and ornaments." According to the same source, "Upon the base of one of the columns is engraved the following: 'This gallery and sixty-five pictures were presented to the nation by Henry Tate for the encouragement and development of British art and as a thanks offering for a prosperous business career of sixty years'" (The Tate Gallery [The National Gallery of British Art]). Among the building's "ornaments" are fierce-looking winged lions and rather glamorous sphinxes on the outer wall, and two dramatic and powerful sculptures flanking the entrance — on one side Henry Fehr's Rescue of Andromeda (1893), and on the other, Sir Charles Bennett Lewes-Wittewronge's Death of Dirce (1906). Sir Thomas Brock's statue of Sir John Everett Millais (1904) has now been moved from the lawn in front of the gallery to the street at the rear. The Tate Gallery (The National Gallery of British Art). Boston: H. M. Caldwell, n.d. Internet Archive. Web. 5 March 2011.